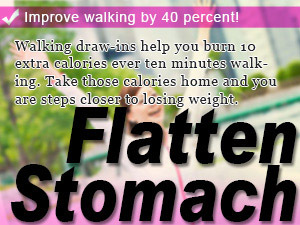 Burn more calories walking with by taking up flat tummy exercises while you walk. How to do walking drawing to flatten stomach walking. A new way to walk. 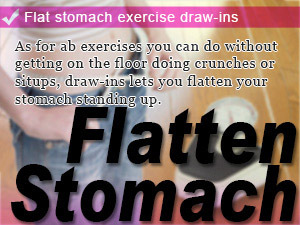 Flatten your stomach while walking by doing flat tummy exercises and draw-ins while you walk. The road to a tighter midsection has never been easy as combining exercise that you can do under the cover on the road, on the go, and wherever you are. Take your diet with you wherever you go by trying walking draw-ins for size, the best decision you'll ever make in losing weight. How do I exercise my stomach to flatten my tummy while walking? Draw-ins, anyone? You may have heard of it but just so wear on the same page let's talk about draw-ins. It is a method of strengthening abdominal muscles and the line of the backbone, etc. by denting the abdominal and canceling the pot-belly. It is said that there is a constriction effect and beauty effect navel. A draw-in walking is a walking performed while carrying out a draw-in and it is said that calorie consumption is up to 40% compared with when you just walk. UP to 40% of the calories consumed by draw-in, don't you try to make the diet, walking in daily life? 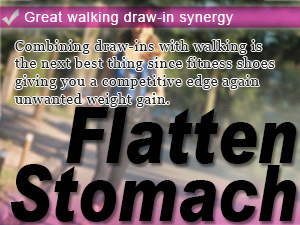 In this take on Slism we will discuss how you can improve upon the exercise efficiency of walking by doing flat tummy exercises while walking to flatten stomach bringing out the synergy between draw-ins exercise walking. Let take a step back and look at how to do draw-ins shall we. Please refer to the page featuring drawing to flatten stomach in only two minutes a day for detailed instruction on how to do the exercise, or skip through reading the following quick tips to get started now. I know you must be thinking, That's it!? 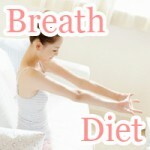 Really easy but you should not underestimate the just make a dent in the stomach. It uses firm abdominal muscles, people who do not exercise regularly, it is pretty tight. Draw-in help train the inner muscles around your stomach said to hold your tummy tight such as your oblique muscles, transversus abdominis, and rectus abdominis muscles that you need to keep strong in order to draw in your stomach and keep it. It may not sound like much, but for people who have already tried it out you know it is quite tiring. If you are just getting started it is recommended that you take baby steps in order to develop climbing tolerance of doing draw-ins as regular exercise. Draw-in, which is hard to be recognized as a training exercise and strengthen the muscles around the stomach, consume a lot of energy. However, although there are two causes stomach as I get pot-belly, it would accumulate fat around the stomach, the other one is lack of muscle strength. When muscular power declines, the belly will slacken and fat becomes difficult to burn. By muscles around the stomach in draw-in, you are able to eliminate the sagging belly, to help reduce fat. By doing draw-ins when you are one the train on your way to work and sit in front of a computer all day, you improve on the effect of walking as much as by 40 percentjust by incorporating draw-ins while you walk in-transit. A 110 pound business woman on her way to work is said to burn as much as 25 calories after walking for only 10 minutes. By doing walking draw-ins, it is said that you can burn up to 36 calories. What that means is that for every 10 minutes you spend walking you can burn 10 extra calories in the process just by adjusting the way your walk putting a little more diet focus into your step. Why don't you consider adding Draw-in to walking such as commuting and shopping, we are usually casually? Become aware of the attitude, people are always walking round the back, also changes the visual impression!! Although walking comes natural, the way you walk while combining draw-ins with walking can make a big difference in the amount of calories you burn off not to mention what it can do for your posture in the long run. That is why we are going to brush up on how to walk to get the best out of walking stomach vacuum draw-ins. As easy as walking may sounds, form makes perfect. When combining draw-ins with walking focus on the area of your stomach always keeping in mind the right form. As for ab exercises you can do without getting on the floor doing crunches or situps, draw-ins lets you flatten your stomach standing up. Combining draw-ins with walking is the next best thing since fitness shoes giving you a competitive edge again unwanted weight gain. Improve walking by 40 percent! Walking draw-ins help you burn 10 extra calories ever ten minutes walking. Take those calories home and you are steps closer to losing weight.